The fall/winter 2015-2016 fashion shows are officially over, having taken us from New York to London, Milan to Paris, in that order. We saw some of the most magnificent pieces displayed on the runway, along with some of the craziest styles. We also paid very close attention to the fall/ winter 2015-2016 color trends	as presented, often a little too dark for our tastes but nonetheless generally perfectly chic in designs and color combinations. The fashion weeks have been full of jewels to behold, fantastic creativity and some rather intriguing presentations, from seeing moving walls to roller coasters to the side of the runway. We’ve found colorful swirling catwalk and had the shows staged in a library, as well as a restaurant. The vibe of each designer’s imaginative creations has brought out the love for fashion from our souls, while we have clearly realized that the passion for fashion does not end there alone; a showcase of garments on a glittering catwalk with crowds sitting all around studded with stars can also be used to show off political slogans, to stand one’s ground on a social issue and to generally raise awareness. It is a bit like Stella McCartney sending out models sporting coats that appear to be fur but are actually a whole different material, not even with the look and feel of the real thing. Her stance on animal abuse has been clear for a long time now. The Marc by Marc Jacobs brand took women’s rights and revolution messages to a whole new level with its use of words such as “solidarity’ and “choice’ on the clothing, from the scarves to the sleeves, the trousers and the skirts. 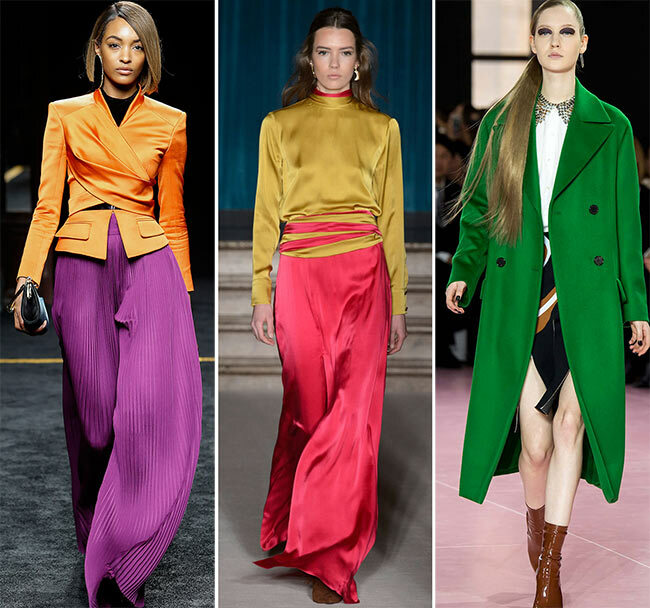 But more than everything else, the fall/ winter 2015-2016 color trends are the one thing that really grab our attention! “Juxtaposition of color from opposite sides of the spectrum emphasizes poise and confidence on the runway. The fall 2015 palette is rooted in multi-faceted, androgynous colors that can be worn to portray effortless sophistication across men’s and women’s fashion; it is the first time we are seeing a truly unisex color palette,’ states Leatrice Eiseman, Executive Director of the Pantone Color Institute. 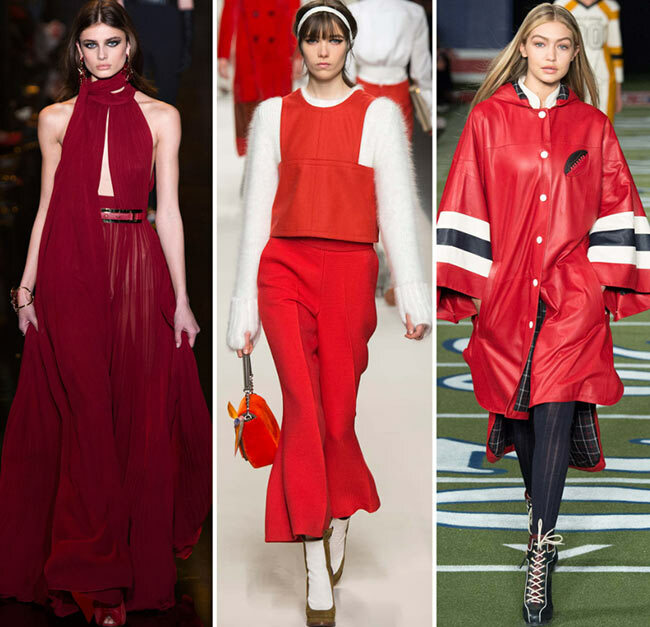 From the earthy neutrals to the bolder statements, the fall/ winter 2015-2016 color trends and patterns used for various runway shows have been reflections of everything that embodies hope, fun, fantasy and everything considered natural. They were chosen because of their effect on an individual’s psyche, from inspiring emotions of love to warm feelings of security. Then again, the black that has been timeless and used so extensively throughout the line-ups presented over the past few weeks has its own connotations, depending on the material it is used on. For the last seasons of the year, designers enjoyed moving slightly away from the typical ’70s looks that rocked the spring/ summer 2015 fashion trends, but also decided to bring in the seduction of the ’20s, the hippie modernists of the ’60s and thoroughly emphasize poise and confidence, though that itself was not quite there when considered the hunchbacked models that looked like housewives on a really bad cocaine trip appearing for Maison Margiela. It was not a time machine we entered though this time around, but rather had the creative geniuses from the fashion world tap into the similarities between this decade and the ’70s world, pulling in aspects of the financial unrest, the international stripe and the climate change, as stated by Leatrice Eiseman. 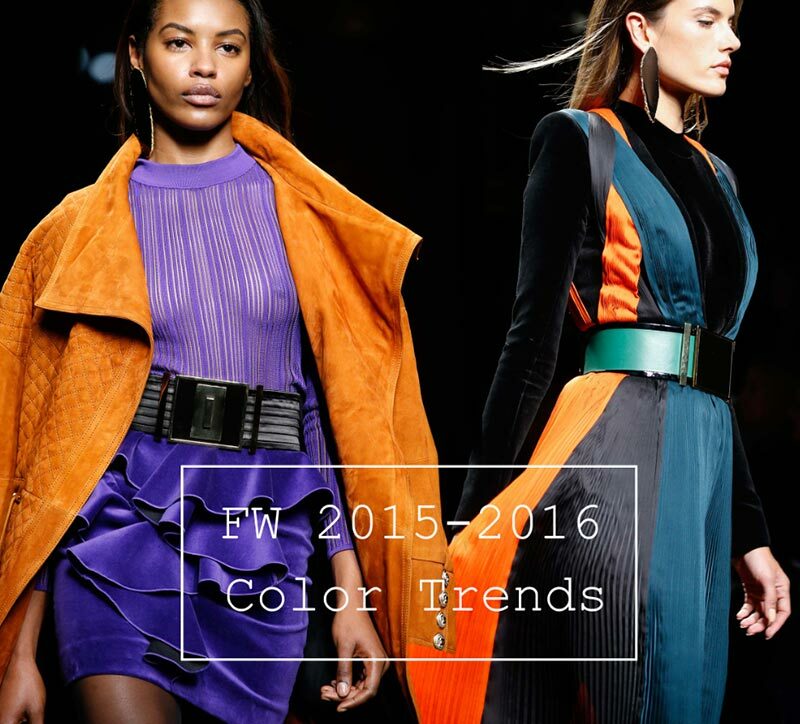 The fall/ winter 2015-2016 color trends include 10 different hues, according to Pantone. They are unisex in nature and have been used in both the men’s and women’s collections. We have been loving the women’s forms though and love the balance they strike. Though, we have certainly seen more colors than that which is offered by the Pantone Colour Institute. While we really get into the 10 main hues, it is important to note that there are a few other colors that have been a constant throughout. Below, check out the complete fall/ winter 2015-2016 color trend report to know what trendy colors to paint your new season wardrobes in! The Stormy Weather hue is like an overcast day, gray and cool, however seems quite dependable and is literally constant, taking over the whole sky, blocking out the sun’s rays and leaving us in a rather “under the weather’ mood. However, it can also come off as a strong color, signifying a protective spell, its power lying in the enduring blue-gray. This is like the calm before the storm really, a hue that makes bold statements in low voices, a boulder that the waters crash against by never move. It is the perfect color for the professional lady, who enjoys her position as CEO and needs to have her wardrobe reflect her inner strength, that immovable willpower that will ensure every obstacle will be overcome. 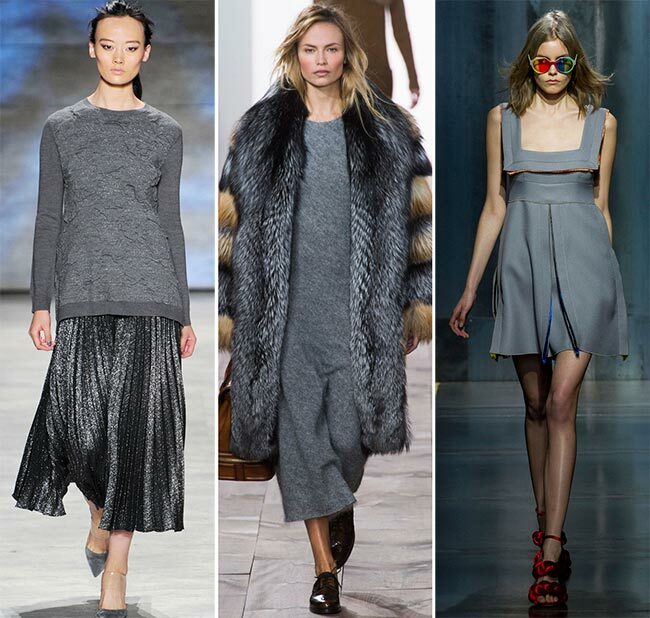 This rich and beautiful gray tone has been spotted a lot at Nicole Miller, Lela Rose, Proenza Schouler, Michael Kors, Stella McCartney, Marco de Vincenzo and others. 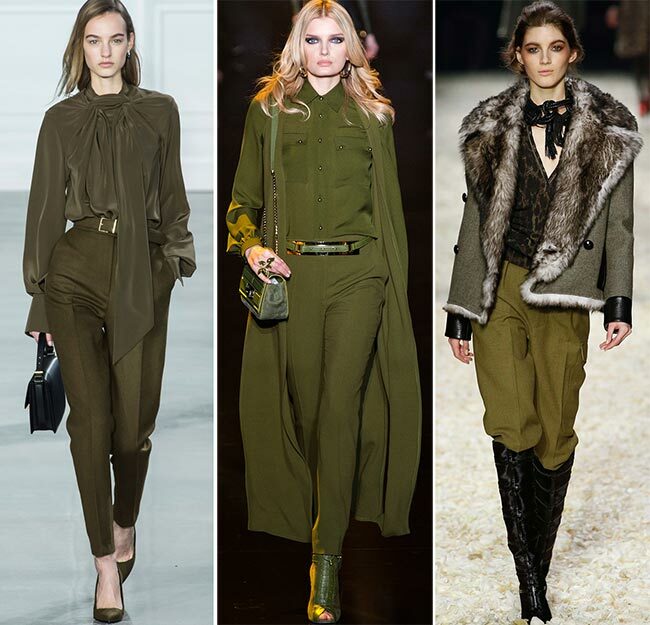 While the olive green coloring of the Dried Herb hue was once used only for military and safari style garments, that khaki that really hits the spot and looks perfect when we go trekking through the woods and mountains, today it is a staple on the runways from New York to Milan, Paris and London. It is a sophisticated and chic color that brings a cool undertone to any garment while still showing it off as a strong piece. It is earthy and grounded, perfectly organic and reminds us of healthy activities. It is also the perfect hue to use in contrast with a few of the other Pantone top 10 colors for fall 2015. We do see a touch of Dried Herb within Olympia Le Tan’s collection, though this is the one hue that seems to receive the least amount of love throughout the fashion world’s creations for the fall and winter months of this year. Despite its lack of major popularity, it looks amazing on the Elie Saab runway when it has been turned into a long sleeved mini dress or a full body jumpsuit with matching jackets, boots and handbags. Saab has always known just how to bring the fashion statement to a whole new level and we have fallen head over heel in love with the whole of his fall/winter 2015-2016 collection. Roland Mouret takes the dried herb hue to a different shade and offers us more of an olive coloring with panelled skirts, thick skirted pencil dresses, and bomber jackets. Tom Ford, Houghton, Mary Katrantzou and Jason Wu also enchanted us with their dried herb khaki interpretations, making us fall in love with this trendy color for fall 2015. Lush and elegant, the teal hue of Biscay Bay makes quite a splash on the runway as we see it take over quite a chunk of some collections. It is a beautiful cool touch against the warmer tones of the different hues used during the creation of the fall and winter pieces, adding the serenity that defines the blue hues with a very slight application of green that invigorates the color and makes it all the more magnetic to view. Think tropical waters and untapped oceans, the soothing notes of the waves hitting the beach sands, the confidence one feels when faced with such beauty and the sheer pleasure of knowing you can conquer those waters day in and day out. It is almost like wearing sea colored nail polish on your toes, feeling as if you have nary a care in the world. This time though, you carry the color of Biscay Bay on your body, in the guise of a dress or a blouse, and know that the aura you exude with it is friendly and inviting. Hermes grabbed a hold of Biscay Bay and gave us a lovely velvety sweater that looks marvellous with slouchy black trousers, while Elie Saab threw in the teal hues to create some incredible floral prints with a sea view background. Those teal dresses do much to have us salivating as well, from the layered skirts of that lace infused mini dress in mock leather to the crepe and lace pieces that also fall above the middle of the thighs but have high necks, long arms and matching boots and gloves. Biscay Bay teal hue was also spotted a lot at Christian Siriano, Monique Lhuillier, Michael Kors, Daniel Silverstein, Cynthia Steffe, Ohne Titel, Temperley London and others. While roses certainly were a big part of the fall 2015 fashion trends utilized in the collections presented on the different Fashion Week runway shows, including Alexander McQueen’s rose crafter dresses, one in the Cashmere Rose style color actually (though it appears to be the dustier version) and the other in a bloody blackened red tone, the color was also quite popular throughout, a soft pink coloring that is rich in vision and quite chic in itself. It appears to belong in a posh neighbourhood, far away from the noise and pollution that a place like downtown New York or London would offer. It is of the earth, but holds a touch if the divine to it, depicting a woman with a persuasive nature who is always calm and composed, perhaps living at the Hamptons. The soft pink color was definitely a good fit with the Chanel collection, appearing in a beautiful midi dress and the classic Chanel shoes on her feet. Perhaps the one designer who has taken an immediate liking to those dusty frosting color, utilizing it in her ballet inspired collection, is Olympia Le Tan, from peplum jackets to tulle miniskirts, matching gloves and even waist corsets. Cashmere Rose seemed to have also inspired Pamella Roland, Marques Almeida, Lela Rose, Katie Gallagher, Dolce & Gabbana, Pascal Millet and others. The darker blues of the Reflecting Pond color were very much in during the fall/winter 2015-2016 runway shows. It was a constant and one, which we found to be quite alluring. Perhaps it was the fact that a clear pond with dark blue waters puts us into a contemplative mood, thoughtful and composed, still in meditation. It is a cool color, without any doubt to it, offering intrigue and chic sophistication, particularly when used on pantsuits. Chanel integrating this color as checked tweed within its collection, while also weaving in a few other hues. Marc Jacobs certainly knows how to get the blues reflected on his neoprene materials used in the final show of the New York Fashion Week. Nina Ricci takes this color to a whole new level with her pantsuits and fringes coats, as well as that watery tulle slip dress. We also love the variations of the Reflecting Pond blue color offered by Tory Burch, Barbara Bui, Tibi and others. Think of gentle sunshine coming out after an especially fierce storm conquers the land. The slight rays bring with them a glimmer of hope for better days, calmer moments and a sliver of cheer. The Oak Buff coloring is as mellow and comforting as one can imagine, a rather warm shade despite the cool undertones, which inspires positive emotions. Giambattista Valli took a stab at including this color in his collection and came up with a lovely floral with knit combination, what with the soft zigzag lines making their way down the body of the tunic in Oak Buff and black and pink dusted white. John Galliano takes a darker hue of the Oak Buff and turns it into skirts, blazers, accents on dresses and coats. It was also seen at the shows of Bibhu Mohaparta, Christian Dior, Victoria Beckham, David Koma and others. 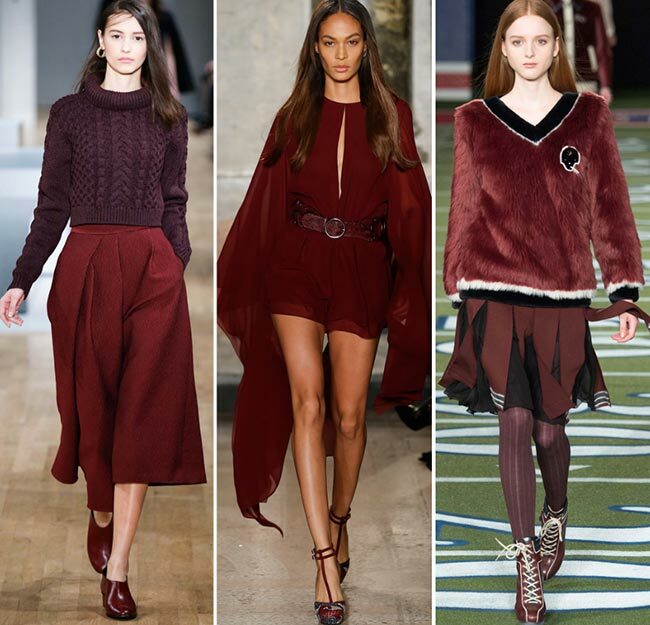 The Marsala wine hue was named the Pantone color of the year 2015, inspiring a whole range of outfits by many a designer through the fall/winter collections. “Marsala enriches our mind, body and soul, exuding confidence and stability. Marsala is a subtly seductive shade, one that draws us into its embracing warmth,’ states Executive Director of Pantone Colour Institute Leatrice Eiseman. It is a versatile color that is equally appealing to men and women, as are most of the other colors chosen to represent the fall and winter months of 2015, with a woody flavour to it and so much space for experimentation. Plus, as the “go-to’ color for beauty, it had to be a hue that would flatter most skin tones, adding a lovely highlight to the cheeks and really turning into one of the loveliest, most captivating colors when turned into lacquer for nails. While it is earthy, it also has a flare for drama, rich and full bodied, a red-brown coloring that brings warmth to any piece it is used on. While it may be earthy, Marsala also defines sophistication in itself, has a good amount of texture and a matte finish only brings its more organic sheen to the surface. It speaks of glamour and luxury, no matter what layer of clothing it has been added to. Maison Margiela throws in a few sprigs of Marsala hued pieces, from the lacy short sleeved mesh top to the sequined midi dress with the flittering paillettes and open collar, revealing the black high necked top underneath. The combination of Marsala and black is actually quite interesting, giving just enough of a contrast while still keeping to the darker tones. No one took on the Marsala look better than Hermes though! Marsala wine also appears in the fall 2015 collections of Tommy Hilfiger, Tory Burch, Emilio Pucci, Roland Mouret, Rebecca Minkoff, Tibi, Zimmermann, Nicholas K and others. 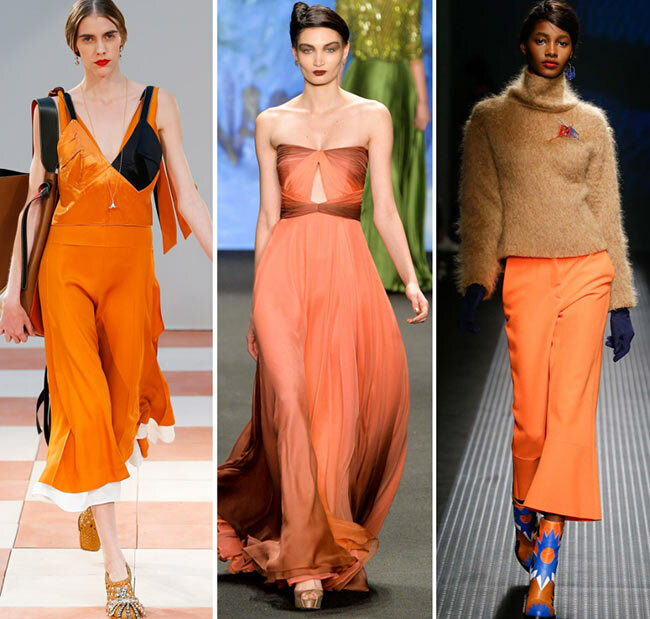 Since the late 1960s and the whole of the 1970s have been the biggest inspirations for the whole year, it seems only fit that Pantone declared Cadmium Orange as part of the trendiest colors for fall 2015. It is a color that offers with it a sense of optimism, a rather laid back desire to see the sun shine and knowing that it will be smiling right back at us. Maybe that is the hippie in us talking, but Cadmium Orange defines fun and fantasy for us and we will certainly take that when it comes! It is a playful color that brings out the youthful nature hidden within us all, no matter what our age, while still maintaining an air of sophistication, appealing to the masses and certainly gentle on the eyes. 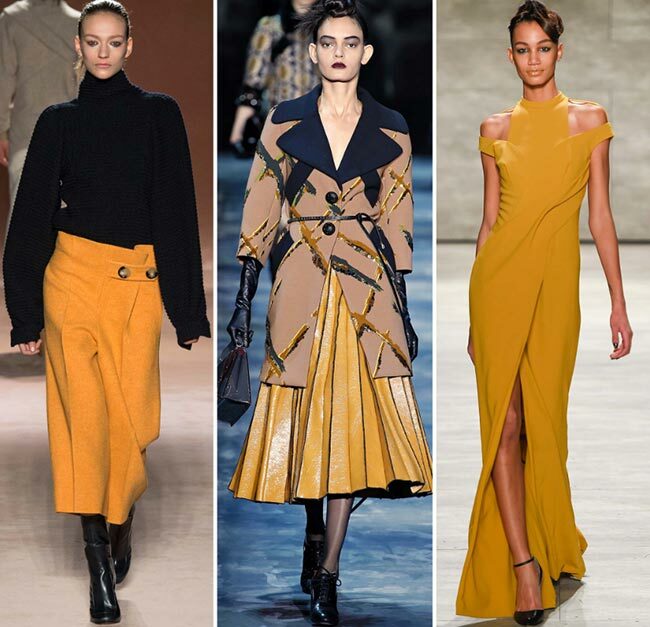 It is a warm color that does not burn you like the sunshine yellow or the pure orange pieces seen of late on the runways. Instead, it offer a relaxing atmosphere, reduces the amount of drama in our lives, yet is strong enough to stand on its own as a striking color used as a contrast among the layers presented. While Marc Jacobs opts for a deeper orange color in his pieces, Balmain combines it with blue and purple hues. We even have Louis Vuitton showing off peplum tops in rib knits, heavy hems and detailing that had them stand away from the body, a slash across the collarbone to show off a sliver of skin without giving in to the plunging necklines. Celine also seems to take a liking to the Cadmium Orange hue, turning it into handbags as well as using it on the garments presented. Victoria Beckham, Naeem Khan, Christian Siriano, MSGM and Fendi also have splashes of orange in their collections. Green and grey combine to create a very cool and soothing color, known as the Desert Sage. It brings monks of the East to mind and moment of pure nothingness, when you meditate under the light drizzle of the rain and allow the summer warmth to ward away the chill of the water lightly falling over you. It is the perfect neutral coloring available within the fall/ winter 2015-2016 color trends, as timeless and unobtrusive as expected to be. It may appear to be as powerful as it is as a hue, but like the sleeping dragon, it holds an unparalleled beauty about it. There is something rather pure about this color, one which inspires inner peace and allows us to discern the mind’s inventions from truth vested in reality. The lady in the Desert Sage jacket looks quite lovely, particularly when coupled with leather miniskirt and black round neck top, a combination found on the Saint Laurent runway show. Giambattista Valli and Desert Sage were a lovely combination indeed, particularly with the designer’s use of the color on furry pockets and center lining on its coat. Noon by Noor and Dennis Basso have also illustrated this chic color in their fall collections. The jewel of the crown is what the Pantone color report for fall 2015 calls it, and a jewel color it certain is. Amethyst Orchid takes both a precious jewel and a flower, combining them to create such a lovely hue that even the violets are jealous. It is an intriguing color, one, which evokes a certain sense of calm along with its sensuality, kind of like a lazy Sunday morning spent under the covers with a lover. It is a languid hue, one, which holds a whole lot of mystery under its pristine waters and that which is bold enough to mark its way over the Fashion Week runways. It is unique to behold, but also belies certain creativity, inspiring a sense of excitement to explore the unknown. 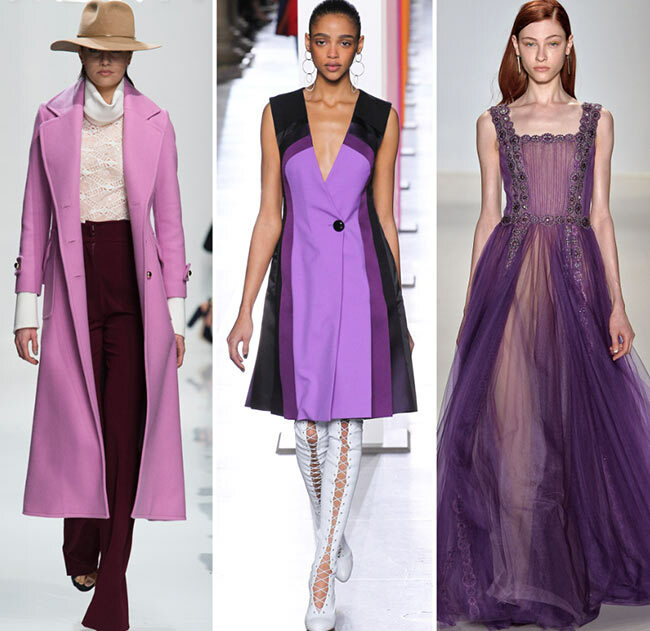 The Amethyst Orchid goes deeper into the jewel color as John Galliano takes charge, offering dresses, skirts, shawls and boots in that color. Tadashi Shoji, Barbara Tfank, Jonathan Saunders, Zimmermann and many others have also illustrated this feminine shade in their fall designs. It has been included in literally almost every collection presented on the runway, in one form or another. Generally, the black is used with feather, frills, and a whole lot of lace and embroidery. It is a timeless color that will never go out of style and its shadowy self makes for a slimming illusion. The black and white combinations have been a constant trend seen on the runway, utilized in at least one or two pieces within most runway shows. Louis Vuitton was one of the last fashion houses to show off the black and white looks, from leather pieces to shiny satin. 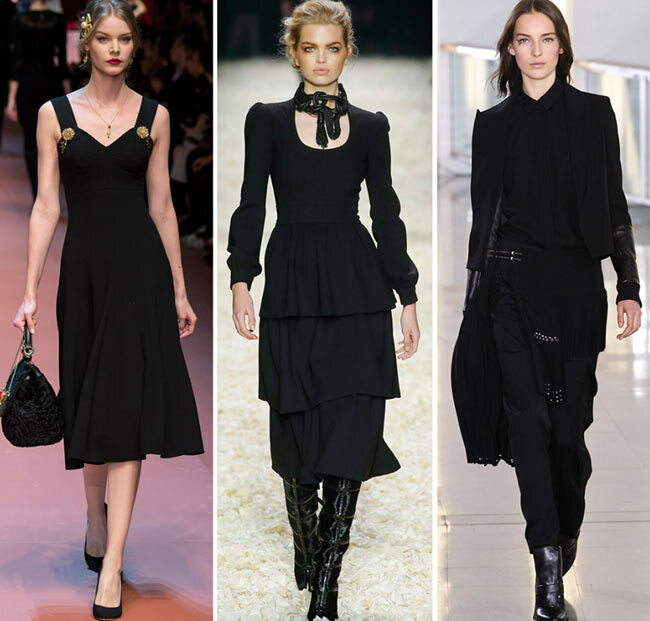 We have lots of black appearing in the fall lines of Vera Wang, Anthony Vaccarello, Dolce & Gabbana, Tommy Hilfiger and many others. If you thought that the fall 2015 colors were all going to be dull and dark, you really thought wrong. We were so pleasantly surprised to see the classic reds, from Alexander McQueen to Jonathan Saunders, Saint Laurent’s polka dot and tulle version to Hermes’ high neck long sleeve maxi dress. Red couldn’t but appear also in the collections of Dolce & Gabbana and Versace, and we have seen it also at Emilio Pucci and Miu Miu. This was one of those futuristic colors that came up a few times over the weeks, the last of which was included in the Louis Vuitton fall/winter 2015-2016 collection on the Paris Fashion Week runway. The silvery metallic coloring makes for lovely peacoats as well, with wide laps and coming down to mid-thigh, a look found on the Saint Laurent fashion show just two days ago. 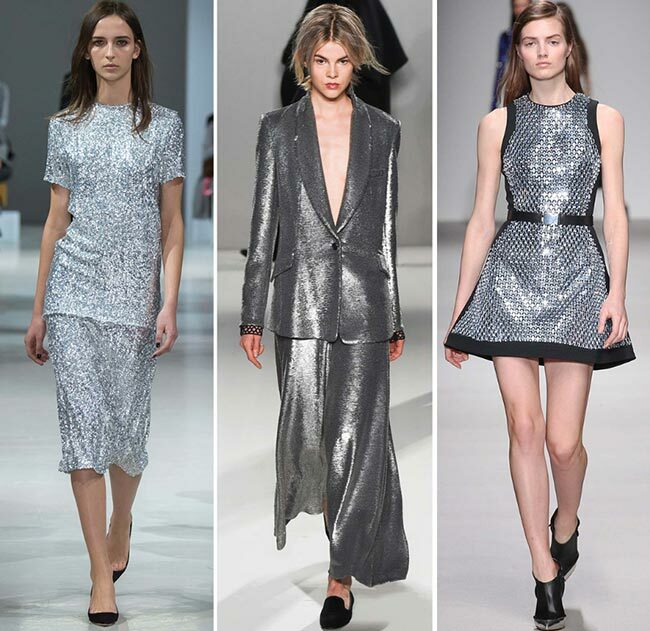 A sparkling metallic silver dress that glitters with every step was also a statement piece within the Nina Ricci collection. If we noticed all the black that was on the runway, as well as the black and white combinations, there was no missing the stark white pieces that appeared all over, from Sonia by Sonia Rykiel to Alexis Mabille, Dsquared2 to Laura Biaggiotti. 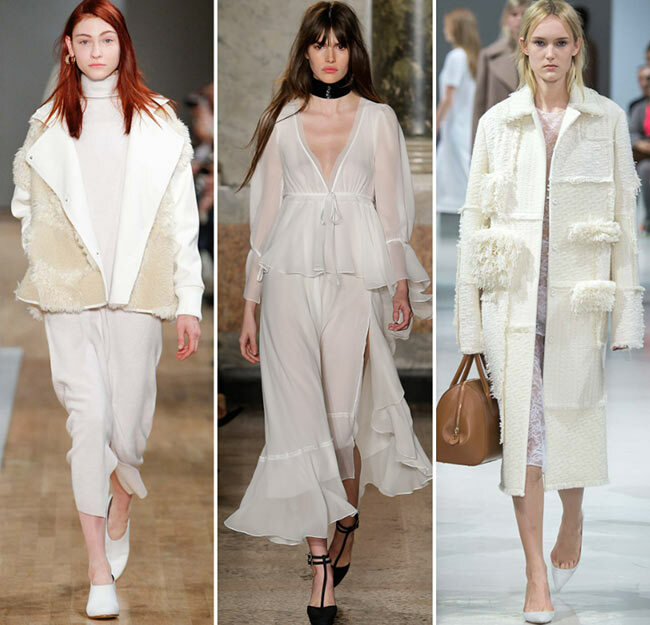 Marni wowed us and Emilio Pucci threw us out of this world with those amazing white pieces presented on all the different runway shows throughout the last few weeks. 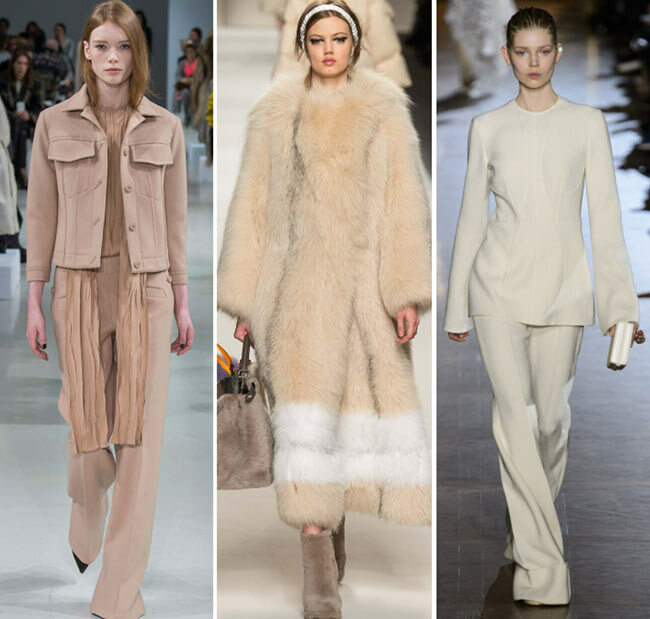 On the other hand, soft cream, beige and ivory tones made an appearance in the fall collections of Philosophy, Michael Kors, Tommy Hilfiger, Fendi and Ralph Lauren. 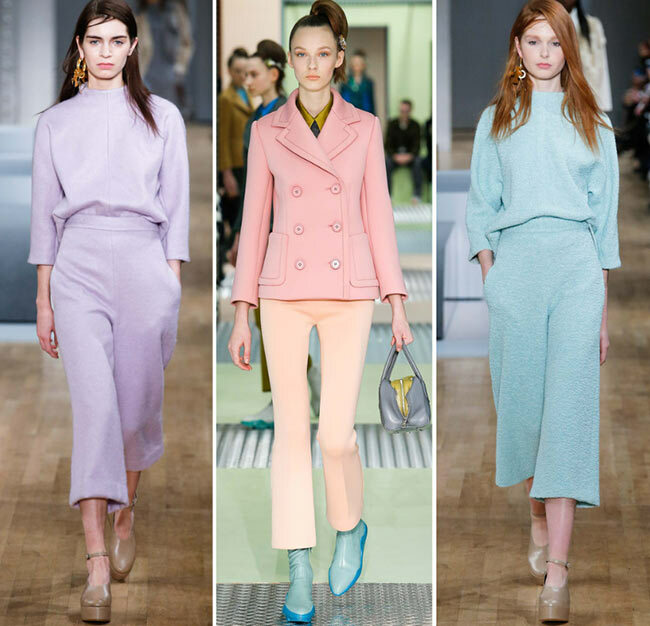 We are used to believe that innocent pastel colors are meant for the warmer months, however, many designers decided to bring softness and warmth to their fall collections using big proportions of pastel colors, from baby blues and pastel yellows to dusty pinks and lilacs. 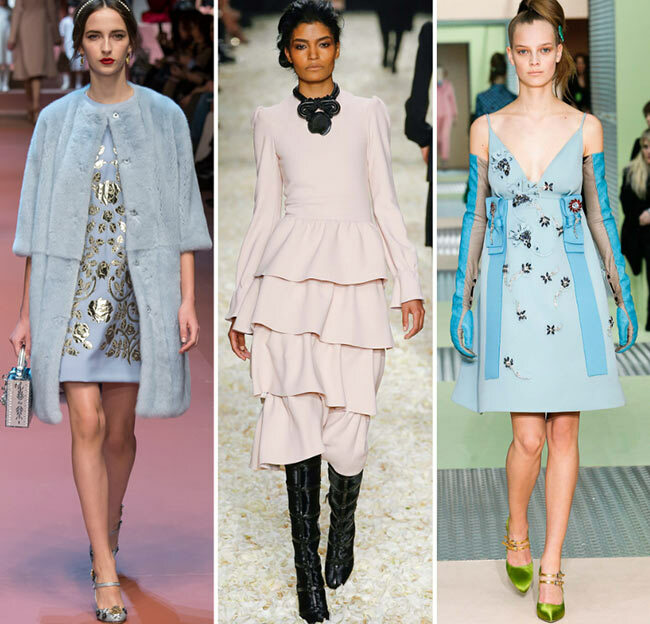 Powder pastel colors look especially chic in the fall collections of Dolce & Gabbana, Prada, Christian Dior, Missoni, Dries Van Noten and others. Some designers decided to differ from all the others and went to the Eighties style ditching the year’s trending Seventies and Sixties. As a result, many fashion shows brought a burst of bold and bright colors, from the rich greens spotted at Christian Dior to the bold yellows and greens of Versace. We saw an eye-feasting bold color palette used throughout the collection of Jonathan Saunders, while Miu Miu managed to combine those busy prints with rich oranges, greens and yellows. 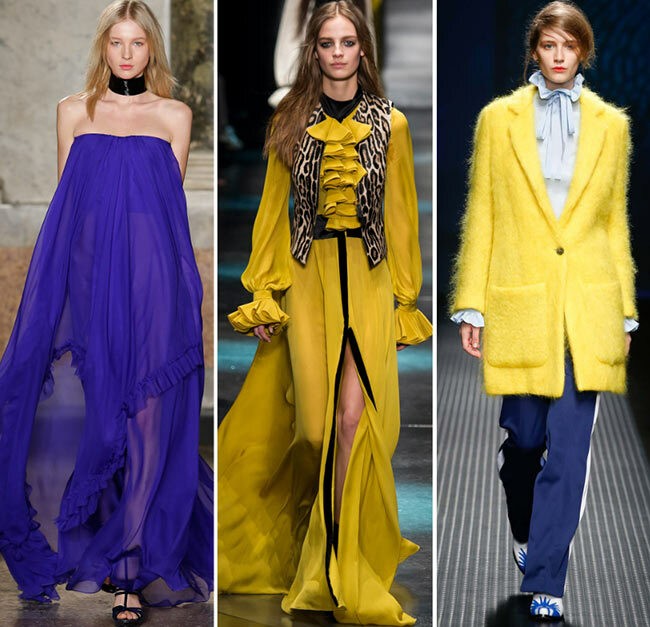 Mustard also appears quite often, looking especially chic in the collection of Roberto Cavalli. Balmain’s ultra-colorful collection is a dream for those fans of bright and bold shades. Alongside the Marsala wine shade, which is quite like a rich burgundy tone with touches of brown, the fall/ winter 2015-2016 color trends also bring all the possible shades of brown, from chocolate brown and rust to milder brown tones bringing warmth and comfort to your winter dressing. 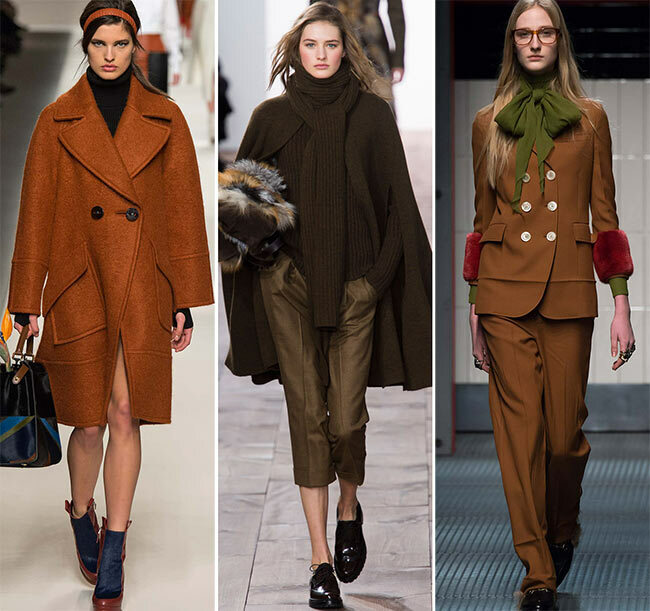 Different shades of brown made an appearance at the fall shows of Michael Kors, Gucci, Tommy Hilfiger, Christian Dior, Anthony Vaccarello, Marni and others. From those charcoal grays, blacks, browns and beige tones to soft pastels, rich Marsala wines, jewel tones and splashes of Eighties bold hues, the fall/ winter 2015-2016 color trends have it all to cater to everyone’s fashion cravings and to help you dress in the most flattering shades for your skin tone and personality. And it’s all up to you to decide what trendy shades you are going to paint your new season wardrobes in!